HarperCollins is proud to present its incredible range of best-loved, essential classics. 'Melanctha Herbert was always seeking rest and quiet, and always she could only find new ways to be in trouble.' In Bridgepoint, USA, people get trapped into lives they didn't choose, without means of escape: Anna, a sweet but intimidating German housemaid; Melanctha, a troubled young woman whose passion threatens to tear her apart; and Lena, a timid girl bullied into work and marriage. 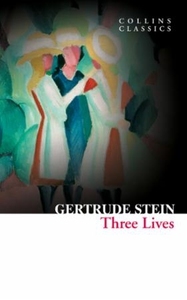 In this ground-breaking collection, Stein depicts the interior lives of these women, struggling to find happiness in an unkind world. Gertrude Stein was a pioneering figurehead of Modernism, and a mentor to writers like Ernest Hemingway and F. Scott Fitzgerald. Written in 1909, Three Lives captures the artistic styles of Picasso, Cézanne and Matisse, and uses them to create heart-breaking portraits of working-class women.